History of Jahrling Ocular Prosthetics, Inc. The elder 'Jahrling' (Raymond) who is semi retired, majored in a 4-year Commercial Art and Mechanical Drawing in a technical trade school which included weekend courses at the Chicago Museum of Fine Arts. After graduation, and military service in WWII, he completed 3½ years of a 5-year college course in Industrial Engineering & Design. At this time he took a sabbatical to gain practical use and knowledge of plastics. A sabbatical that would turn into a career! Unbeknownst, this background in art, physics and chemistry, made him amply qualified to begin training in both fabrication and fitting of plastic ocular prostheses. (Note: This was during the 'transitional era' when the eye making profession was converting from the 'glass eye' to the 'plastic ocular prosthesis.') Mager & Gougelmann, Inc. was his employer in Chicago (1949). Because of this background, the apprenticeship progressed quickly to managing M&G's Boston branch office. Experimental designs for partially embedded impression moulded acrylic corneas with optics. (Planned for human use when donor corneal transplants were unsuccessful.) This preceded the development of the silicone cornea with optics. Lectured periodically to the eye residents, nurses and operating room staff on the various implants, plastic prostheses and their hygiene care. Color cinemaphotographer of oculoplastic surgical procedures, which included three half hour documentaries on 'Eye Research' and 'The Effects of Glaucoma' for the Massachusetts Lions Eye Research Fund, and the Dr. Carl Johnson's 'The Frontalis Sling for Ptosis Correction' for the Harvard Medical School. Photographer (35mm) & Ocularist of eyelid and orbit problem cases. By late 1962, the invaluable 10 years of ophthalmic research experience led to the to establishment of the Jahrling Ocular Prosthetics lab. 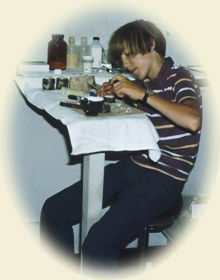 The formation of Jahrling Ocular Prosthetics allowed the second generation of Jahrling's (Joyce, Eric and Kurt) who had already begun a pre-teen informal indoctrination to the profession of ocularistry by taking additional art courses during their grammar and high school summer vacations, and also by osmosis. They would view 'before & after' patient case slides, and the pre-edited movies of oculoplastic surgical procedures. Their formal apprentice training with their father began after their college education. This apprenticeship included 10,000+ hours of 'hands-on' training, plus taking the required, credited educational courses offered by the American Society of Ocularists for their Board Approved Diplomate Ocularist (BADO) diploma. The culmination of this was becoming Board Certified Ocularists (BCO) by the National Examining Board of Ocularists (NEBO) respectively in 1981, 1987, and 1989. Our joint family experience, together with continuing education (CE) credits assures us of a share in the leadership of our profession.